Our escape room games are great for team building or team rewards. Research on effective teams show their productivity is directly related to a team’s energy and engagement outside of the office. 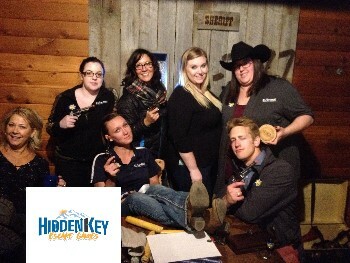 Energy, engagement, and exploration are key to team communication and success at Hidden Key Escape Games! Hidden Key Escape Games are a fun way to engage in each of these aspects. Develop new connections among members of your team. Let them discover hidden talents and strengths of others. Share an event to create a common experience. Escape room games are recognized as a new trend in team building, from CBS to TeamBonding. Schedule your team building games outside our normal hours, or book a regularly scheduled game. Larger groups can be scheduled sequentially or in different games at the same time. Schedule an event to fit your plans by calling 406-823-0564 to find out more. Contact Us. Groups between 10 and 18 people will be split in half. Each group will play a different game at about the same time. Groups over 18 will take additional time because we can not accommodate everyone at the same time. We are opening another game this summer. That will allow us to have groups as large as 30 play at once!